There is increasing recognition within psychoanalysis and related therapies that awareness of the body is important in understanding and treating patients. 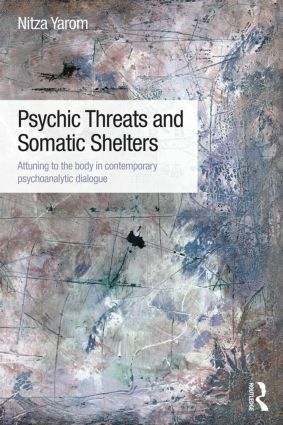 Psychic Threats and Somatic Shelters explores the ways in which adults and children become acquainted with the range of physical issues that arise within their psychoanalytic or psychological treatments. Somatic shelters, which explores the variety of physical symptoms encountered by patients, including problems with weight and eating; with sensation through sight, sound, smell and taste; in movement through hyper activity or rigidity and through the communication of physical pain. Embodied dialogue, in which the author updates the use of the basic technical principles of psychoanalysis to involve the body in the treatment including transference and counter-transference between analyst and patient. In Psychic Threats and Somatic Shelters the emotional communication of these body narratives are vividly demonstrated in the treatments presented, here the interaction in the consulting room is revealed in bodily resonance and its therapeutic effects. This book is written for psychoanalysts and psychotherapists, psychologists, body therapists, family therapists, social workers and art/movement therapists. Preface, Acknowledgments, Part I Somatic shelters; 1. Subjects in sight, sound and touch; I see you/ you see me, The sounds in the consulting room, Touch and the other senses, 2 Subjects in smell and taste; Smells in the consulting room, Taste and distaste in the consulting room, 3 True and false movement; Spontaneous gestures: on physical and psychic movement, Rigidity: on muscular 'second skin', pseudo-independence and beyond, 4 The woman's body; femininity in turmoil, Four young women: clinical vignettes, Narcissistic hurt and feminine dis-identification: discussion, 5 Fatness and skinniness: object-relations in cultural perspective; Skinniness in evacuation and swallowing up, Overweight as 'second skin' and 'false self, The idealized body of the absent subject: A cultural perspective, 6 Ailing marital relations, Family culture of somatic shelters, Difficulties in contemporary marital relations, Somatic shelters in mid-life coupling, 7 When the body ails between parents and children; Difficulties in contemporary parenthood and the child's body, Ailment between mothers and daughters, Ailment between mothers and sons, The body between fathers and daughters, The body between fathers and sons, 8 On pain and mutual pain, How we manage our pain: Psychoanalytic perspectives, Painful experiences, Part II Embodied; Dialogue, 9 Essentials in attuning to the patient's body, Freely-associating and listening, The oedipal, the pre-oedipal and the inter-subjective, Presence, resistance and self-expression, 10 A process of self-expression and resistance, Self-expression and resistance at the beginning of treatment, Self-expression and resistance in the progress of the treatment, Self-expression and resistance at the termination of treatment, 11 The vital bodily-counter-transference; The analyst attuning to his own body first or expanding, counter-transference, The sick analyst, The analyst falling asleep, The analyst serving as eyes, 12 Readiness for bodily-transference, The patient's use of his analyst's body in transference, The uses of the object's body, Experiencing subjectivity via the analyst's body, 13 Interpretation between the material and the metaphoric; Spontaneous intervention and dialectic position, The topographic interpretation, Topographic interpretations in vivo, 14 Primitive mental states and inter-subjectivity; Interpreting and misinterpreting, Mutual reclaiming, 15 Dialogue of narratives and enactment, Body narratives, Enactment: an honest and responsible dialogue, References. Nitza Yarom is a psychoanalyst and psychotherapist in private practice in Tel-Aviv. She is retired from an academic career and now focuses on supervision and clinical seminars. She is the author of several books, including Matrix of Hysteria (Routledge, 2005).